Available 24 hours a day and 7 days a week (incuding special holidays), Palmway Locksmith is your go-to local locksmith company for all types of locksmith services, including ignition key repairs. Since we know that you’re always on the go around the city, major problems like getting a broken ignition key might often go unnoticed when you’re in a hurry. This could become a major hassle if you’re on your way to somewhere else, like your school or office, or if you’re just going to go out to run some errands. Although getting a broken ignition key might be tempting to fix on your own, the professionals over at our company recommend calling trustworthy and reliable locksmiths, such as the ones over at our company, to check out and fix your broken ignition key. Guaranteed to always come on time (30 minutes after a call and request is placed) you can count on our licensed locksmiths to be equipped and prepared to handle your situation so that the repair service runs smoothly. Our locksmiths will be bringing with them state-of-the-art repair tools and other equipment, such as key duplicators, if the need arises. Our locksmiths will be the ones to determine whether your key is broken beyond repair or can be fixed using the right equipment. Rest assured that everything will be discussed (including rough estimates) prior to and after the service is done. A written estimate as well as an official receipt will be provided for your convenience. You can also ask our locksmiths to walk you through the entire locksmith service as well as ask them for any special requests regarding the service. If you or anyone you know needs ignition key repairs in the Corona area, call us now and get the best locksmith service with a highly competitive price! No call waiting is guaranteed to all our customers in Corona and our 30-minute arrival time policy is always in place. Our hotline is also open for any comments, questions, suggestions, and concerns. 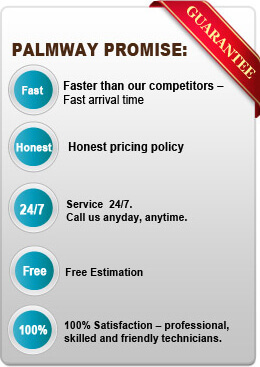 For billing, Palmway Locksmith accepts both cash and major credit cards.